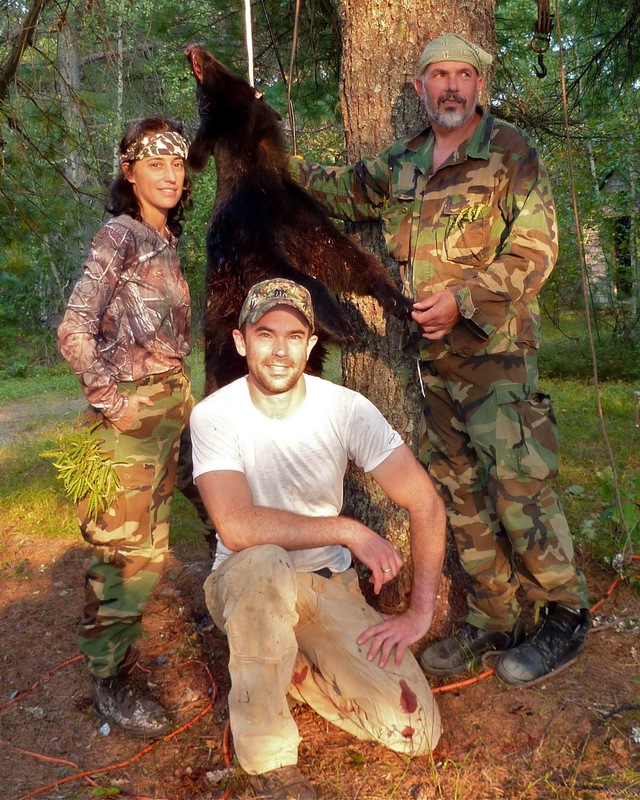 The Maine Outdoorsman: Black Bear Predator Calling, Last Minute Fishing & Crow! Black Bear Predator Calling, Last Minute Fishing & Crow! Bear hunting provides an adrenaline pumping adventure, guaranteed to raise goose bumps on even the steadiest and most reserved outdoors people. A primal urge exists deep within the primitive mind that signals an instinct to run when an immense meat eating animal lumbers out of the woods, suddenly and mere yards from a hunters shooting position. Few other creatures appear quite so mighty and powerful as a truly massive black bear and even professional hunters feel their hearts beat heavy just at the sight of these bruins. Washington County is home to one of the most productive black bear habitats in the state and is well know for growing trophy black bears. If you have never tried bear hunting, I strongly suggest giving it a try! While black bear are primarily hunted in Maine over bait or by using dogs another method of hunting them quickly growing in popularity now includes using predator calls. Hunters can hunt bears without using bait or dogs from August 26, 2013 through November 30, 2013. Calling bears offers a different type of hunt and it can be extremely difficult to trick them into shooting distance. Unlike calling other predators like the finicky fox and the caution coyote, calling bears requires either a lot of lungpower or an electronic calling device. Bruins have extremely short attention spans and when the calling stops, so will the approaching bear. Screaming rabbit, is a popular Maine choice but hunters will need to practice an extreme level of patience and maintain continuous calling sequence lasting for an hour or more before they can expect a bear to lumber into shooting range. When choosing a location to set-up your calling sequence, a number of factors must be considered. Sites should preferably be in thick wooded spots beside swamps or near small streams where food and water is readily available. Hot September days can often find big bears hiding out in these damp areas as a way of staying cool in the full heat of the day. The cedar swamps closely bordering blueberry patches or beechnut-laden ridges are prime black bear habitat. Extensive scouting for sign and the use of game cameras will greatly help hunters pinpoint prime areas and maximize their time spent calling. Determining the predominant wind direction and placing stands or ground blinds directly downwind or crosswind from the expected direction of approach will increase the chance of fooling the sensitive noses of these bruins. Hunters should still always be cautious; as a bear coming in to what it believes is lunch is often anything but predictable. Up for the challenge of calling in a bear this September? I suggest exploring the area around “Fletcher Field”, DeLorme’s The Maine Atlas and Gazetteer (MAG), Map 35, D-3, D-4, D-5. To anglers looking to get in some last minute fishing this month, I offer a gentle reminder about an easy to forget August rule that can quickly get you in hot water with the local game warden. Starting on August 16, fishing in brooks, streams and rivers in Washington County is restricted to the use of artificial lures or flies only and the combined total daily bag limit for trout, landlocked salmon and togue is 1 fish. Local convenience stores will continue to sell trout worms and crawlers but anglers should remember to be cautious of the limitations. Instead of bait, fish favorite flies or small spinners and try your luck on the small streams along Route 9 in early evening and morning. Though along a major travel route a majority of these small streams are not fished much beyond 100 yards from the roadside. A quick walk through the streamside underbrush will yield fishing hot spots that have remained untouched. Crow hunting begins on August 1st and runs until September 21st. With a little invested effort, hunters can create a dozen or so simple handmade silhouette decoys that are fun to make. Having kids assist with the sanding and painting makes this an even more enjoyable activity and a good way to get them to understanding how decoys function as a way to lure in wary avian species. Be glad you never threw out even the smallest scraps of ½ inch plywood as they can be easily converted to crow shape with just a few minutes work with the jigsaw. For a pattern, do an Internet search using Google with the key words “crow silhouette pattern” this will load up several different design options. By drilling a small hole in the bottom for a stake made from the remains of a metal coat hanger the silhouettes can be set out in fields or with a small eyelet screwed into the top, suspended from trees to add even more realism to your decoy spread. Once the silhouettes are in place all it takes is a hand held crow call to complete the ruse and hunters will enjoy fast action. Crows tend to be destructive and cause considerable crop damage. Most landowners understand this problem and are happy to have you work to eliminate crows from their properties. Just please remember the cardinal rule of “leave only foot prints”, when accessing someone else’s land to ensure it remains accessible to future hunters. Thanks for the heads up about the fishing..I hope to be heading down The Airline this fall! I had big plans to be sitting at the WIlderness lodge this long weekend to hang out with the bear hunters and do some fishing as well BUT you know what they say about best laid plans! LOL! Good luck and keep me apprised on how you do! That first shot - looks like Dave Cantabury behind you.